Check out all the extra fun here at Broadway Grand Prix. Go some rounds on our Challenge Mini Golf or dare to ride the Sky Coaster. All the fun things to do are here at Broadway Grand Prix. Take the competition off the race course and onto the golf course! Featuring two challenging 18-hole mini golf courses and all new prize spinners, everyone will have a good time! Mini golf is included in your All you can ride armband! Test your skill and strength on our three outdoor rock climbing walls. Varying in difficulty, be sure to challenge yourself. Close-toed shoes are required to climb and climbers must weigh between 40 and 250 pounds. NOT INCLUDED IN ARMBAND. 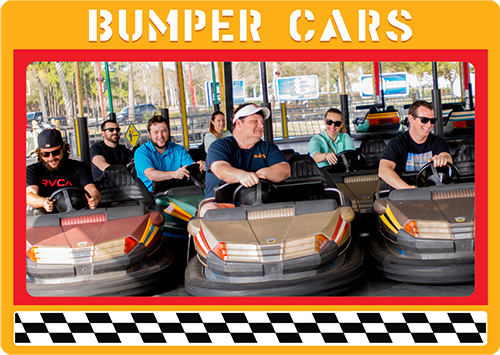 Bump into your friends on the Bumper Cars! The Bumper Cars are included in the all you can ride wrist band. You can’t go wrong in 20,000 square feet of arcade games. Hangout in the Grand Prix Arcade with over 90 games for hours of so much non-stop fun, even the parents won’t want to leave. With games for all ages, expect to see a few of your favorites including skeeball, basketball, and MORE. Tokens for game play are available for purchase in the arcade. You and your friends can touch the sky with the Broadway Grand Prix Sky Coaster. See our Big, Bigger, Biggest to include the Sky Coaster in your All you Can Ride Wristband.